Lazy eye (amblyopia) means someone has poor vision in one eye, even though the eye is otherwise healthy. This happens because they haven't used that eye enough in early childhood so the nerve pathways from that eye to their brain haven't developed fully. So if your child uses one eye at the expense of the other eye, the eye they don't use becomes lazy. No matter how old your child is, it is very important that they get the treatment they need to improve their vision as soon as possible. The older your child gets, the more difficult it is to improve vision – the earlier the treatment the better. something that stops their vision from developing normally, for example a droopy eyelid or a cataract. Children with a lazy eye are mostly treated by putting a patch over their good eye to help their brain to use the poorly sighted eye. Glasses, or surgery to remove a cataract or other physical problem are usually not enough to treat them successfully. Do not try to put a patch on your child's eye yourself. This must only be done with guidance and supervision from an eye health professional. See an optometrist or ophthalmologist (eye doctor), or ask your GP to refer you to one. 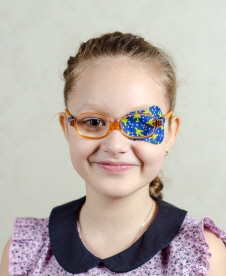 The aim of putting a patch on your child is to make their vision equal in each eye, which means their brain sees equally well through either eye. If they are short-sighted, long-sighted or have astigmatism they will also need glasses. How long the patch needs to stay on depends on how lazy their eye is to begin with. The poorer the vision, the longer they will need to wear the patch. Treatment can be tough because you're forcing your child to use an eye with poor vision. They may not understand why they have to wear a patch, so as soon as they are old enough, explain to them what is happening. Make sure your child continues wearing the patch, even if it is difficult. If left untreated, the vision in the lazy eye will become worse, which may be permanent. Your child will regularly need to be assessed by an eye health professional, to check on their treatment and progress. It can be very harmful to a child's vision to patch an eye without any guidance or supervision from an eye health professional. You can cause a good eye to become bad if it's incorrectly treated. Do not patch your child's eye yourself. Make sure you attend any follow-up clinic visits, either in a public hospital or private clinic. American Academy of Ophthalmology – Amblyopia: what is lazy eye? These pages give more detail about the causes, symptoms, diagnosis, and treatment of lazy eye. Written by Canterbury optometrists. Adapted by HealthInfo clinical advisers. Last reviewed May 2017.